DETROIT -- Mayor Mike Duggan said he saw a dead mouse, children wearing coats in cold classrooms and a gym floor too warped for play during a tour of some Detroit public schools Tuesday. He pledged to quickly come up with a plan to improve the condition of the buildings. The visits occurred as two dozen schools were closed because of a sick-out by teachers who are upset about pay, class sizes, rodents and mold. "Our children need our teachers in the classroom. ... But there's no question about the legitimacy of the issues that they're raising," the mayor said. The number of closures was not as high as on Monday when more than half of the 100-school district was shut down and more than 31,000 students stayed home. Spokeswoman Michelle Zdrodowski said the number of kids affected Tuesday wasn't immediately known. Unlike some big-city mayors, Duggan has no control over schools. Detroit's debt-ridden district of 46,000 students has been under state oversight for nearly seven years. The district is run by an emergency manager appointed by Republican Gov. Rick Snyder. But the city can inspect the buildings to make sure they comply with city code. 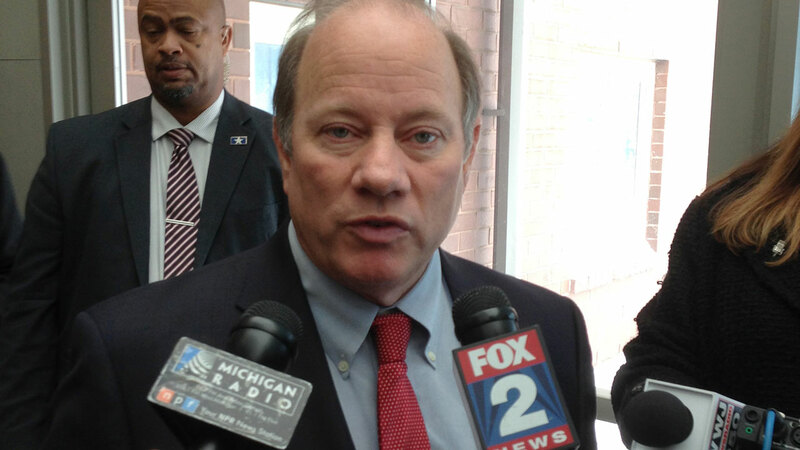 Duggan said the condition of schools is a "mixed bag" with some in good shape. "We're still gathering information and we'll have a plan" Wednesday, he told reporters at Fisher school on the east side. "We've seen a couple of school buildings that are well-maintained and then saw some conditions that were deeply disturbing, including a school where the children have no gym class because the gym floor is buckled from roof leaks," Duggan said. He said it was "heartbreaking" to see some kids wearing coats in the morning until classrooms warm up by lunch. The governor has called for the state to commit $715 million over a decade to address the district's $500 million debt and relaunch the district under a new name. But his plan has yet to receive support in the Legislature, which is controlled by fellow Republicans. During a visit to the Detroit auto show Tuesday, Snyder said the sick-out by teachers was "really unfortunate." "There are other venues and ways if people have issues. ... They shouldn't be doing that at the expense of having kids not in class," the governor said. The Detroit Federation of Teachers is not part of the sick-out, but union officials have been very vocal about school conditions. Zdrodowski said "there's no denying" that some schools need attention, adding that problems are investigated as soon as possible. Nonetheless, the district is deeply troubled by the wave of teacher absences. "We're investigating all of our options. Kids need to be in school," Zdrodowski said of teacher absences.